WASHINGTON — The education of the star-studded class of House freshmen has begun. Lesson one: Speaking with the bluntness of a candidate can produce swift and uncomfortable results. Rep. Rashida Tlaib learned that before lunch Friday, when her profane remarks the night before vowing to impeach President Donald Trump drew almost no support, and plenty of pushback, from members of her party. 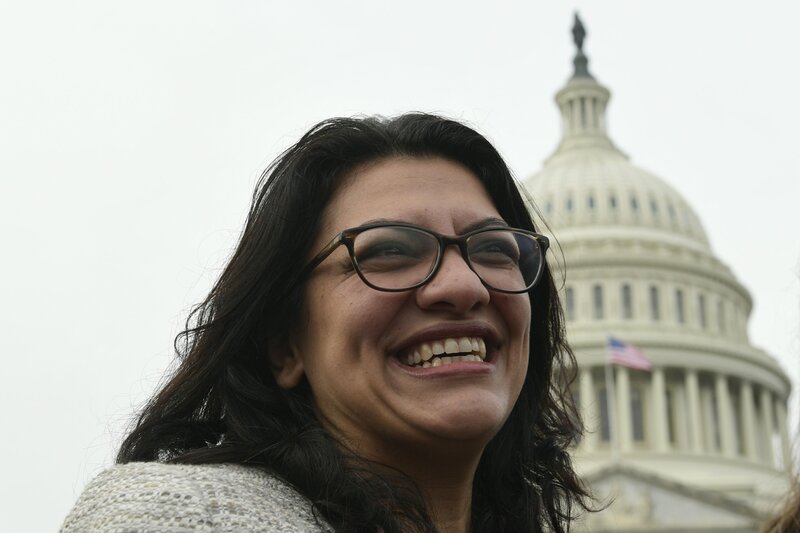 “It’s been pretty intense,” Tlaib, D-Mich., told The Associated Press in a brief hallway interview Friday as she reported to the House to face her colleagues. Hours after Tlaib was sworn in as part of the history-making class of freshmen that helped flip the House to Democratic control, she ran afoul of the widespread sense among her colleagues that they should focus for now on health care and other policies rather than impeachment — at least until special counsel Robert Mueller’s investigation concludes. “We’re gonna impeach the motherf—er,” Tlaib exclaimed during a party Thursday night hosted by the liberal activist group MoveOn, according to video and comments on Twitter. It was a striking coda to the Democrats’ heady ascendance to the House majority Thursday, sparking unusually public corrections from House veterans. “I disagree with what she said,” said House Judiciary Committee Chairman Jerrold Nadler, D-N.Y., during a CNN interview. His committee would be the one to begin impeachment proceedings. Newcomers routinely stumble as they learn how things are done on Capitol Hill. But Tlaib and her classmates have been celebrated in magazine profiles for their independence and their promises to stand up to the powers that be. By rebuking one, the more seasoned Democrats were effectively warning the others. “I think some of our new members probably don’t realize that you are always on, that when you are a member of Congress, there’s always someone listening,” said Rep. Jan Schakowsky, D-Ill. She said she hopes Tlaib’s remarks aren’t news for long. More than Tlaib’s profanity, it was her vow to impeach Trump that drew her colleagues’ disapproval. Tlaib’s defiance flew in the face of Speaker Nancy Pelosi’s warning to focus on policies the candidates had promised ahead of the Nov. 6 elections. The timing also chafed, just hours before congressional leaders were headed to the White House to try to resolve the standoff over the border wall Trump is demanding in exchange for reopening the government. Republicans pounced, using the occasion to question the Democrats’ true priorities and Pelosi’s leadership. With a tight smile, Pelosi rejected Tlaib’s profanity and her impeachment vow. Rep. Gerry Connolly, D-Va., served up a reminder to the new members that seniority rules in Congress. Talk of impeachment remains in the air, fueled by a handful of Democrats on Pelosi’s left flank who are pressuring her to more aggressively pursue the issue. But such proceedings appear unlikely for now. Even if the House advances any articles of impeachment, a two-thirds-majority vote to convict Trump in the Republican-controlled Senate and remove him from office would seem out of the question, barring astonishing new revelations. Tlaib wasn’t the only freshman who got a lesson in how one comment can upend Capitol Hill. Some of Tlaib’s classmates were pursued for reaction — standard results when a political ally says something that raises eyebrows. “I am not talking about those things,” laughed Rep. Abigail Spanberger, D-Va., when asked Friday to respond to Tlaib’s remarks. She said she was elected because she talked about preserving health care. “I’m not going to tell anyone else what to do, but certainly, I think, it would behoove all of us to really be working for the people who need” Congress’ help.